I am finally back home. I've been back home for a few days, but there's actually been quite a lot going on. Today is my last day at HP. I've been working there for 5 years. Due to company lay-offs, my position was eliminated. For the first time since Zoe was born, I will be a stay at home mom, and I am so excited for this new chapter in my life. But with my new found free time, I've been able to fit in some crafty projects I've been planning for awhile. I ordered some October Afternoon Calk walk from Paper Issues and making a birthday wreath was something on my to-do list anyway, and it made such a perfect combo. I made a TON of layered flowers, using THIS shape from Silhouette, and then mixed them all up and used various glittered brads to hold them together. 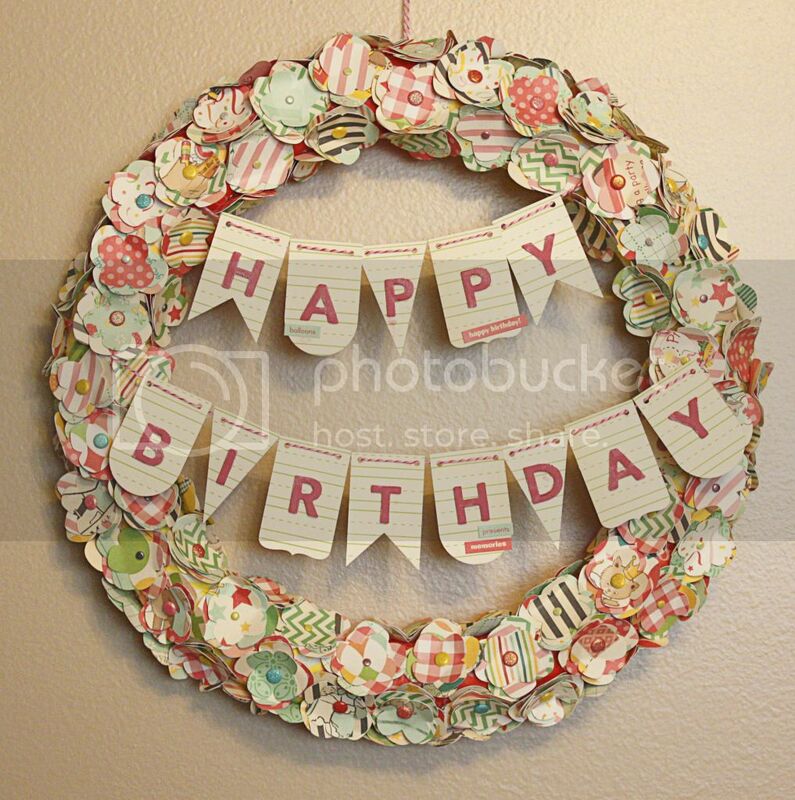 I hot glued them to a washi tape covered wreath form ( so the hot glue wouldn't melt the form) and then tied the banner on. The banner is THIS shape from Silhouette. I used Studio Calico mistable thickers to spell out Happy Birthday. I added a few of the word stickers from the Calk Walk sticker sheet as well. I love the way it turned out. Zoe really loves it and keeps asking who's birthday is next so we can use it. Hope you have a wonderful weekend plan. Check back tomorrow for some sneak peeks of my first Scrapbook Circle kit!